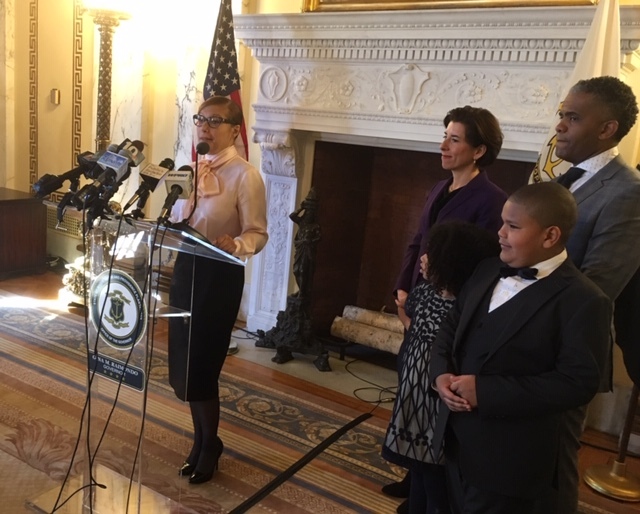 During her formal unveiling before a crowd of well-wishers at a Statehouse news conference, Infante-Green elicited cheers while describing her own story and the approach that she plans to bring to Rhode Island. She said her mother made a dramatic difference in her life by fighting to get her into a better school as a young girl in the South Bronx section of New York City. Infante-Green, now a deputy education commissioner in New York state, said that experience informs her advocacy for all students. Rhode Island has made negligible progress in improving public K-through-12 education for years, even though doing so is considered a vital issue for the state’s future. Recent standardized test scores showing Rhode Island students significantly under-performing their counterparts in Massachusetts helped spark a heightened focus on the topic. Some observers believe not enough accountability is built into the process to dramatically improve public education in Rhode Island. Infante-Green, 48, said her determination and leadership will help to win the day. Infante-Green was a finalist to become education commissioner in Massachusetts last year. The incoming commissioner, who was joined by her husband and two children, faces confirmation by two state education boards. She expects to begin work in Rhode Island next month. Turning serious, Infante-Green said her background made her someone who fights for change for students. Infante-Green’s son, Asher, who is on the autism spectrum, stole the show during his mother’s news conference, flashing a beaming smile. She will succeed Ken Wagner, who served as Rhode Island’s eduation commissioner for four years. He’s set to become an education fellow at the Annenberg Institute at Brown University. Raimondo told reporters she spoke with a few other candidates for the education commission post, but did not identify them. Infante-Green, joined by her family and Gov. Raimondo, said she's in Rhode Island for the long haul.